Peer to Peer download is widely used in recent years. The exchange packets of P2P download have occupied a high ratio of data flow on the Internet. BitTorrent and Emule P2P are well-known network download technology and have become the main exchange and sharing platform among computer users nowadays. Since the download rate of P2P is fast and the cost of network structure is relatively low, it is planned that P2P is applied in sales and provision of digital services. Many users who download files frequently tend to use a PC that runs 24×7 for long-term download. However, users may suffer from high electricity expense and loud noise of the fan. QNAP Turbo Station supports P2P, FTP and HTTP download, providing users a different choice. QNAP Turbo Station is embedded with BitTorrent download client. Simply connect Turbo Station to the network and enable Download Station, Turbo Station can download files independently without PC. Simple activation: By enabling the embedded Download Station of Turbo Station, file download can be executed directly. Users don’t need to install any other software on Turbo Station. Simple web management interface: Management of Turbo Station download tasks can be completed via web browser. You can manage the download tasks via the Internet anytime, anywhere. Convenient QGet software: QNAP provides an easy-to-use and powerful QGet software for you to manage the download tasks of multiple Turbo Station (or TS-201) simultaneously on the same PC from LAN or WAN. You can manage your download tasks from school or office. QGet supports intuitive drag and drop of torrent file, HTTP or FTP URL to the software interface for convenient adding of download tasks. If your Turbo Station is located behind the NAT router, you need to open the ports of some services on the NAT router and forward these ports to the fixed LAN IP of Turbo Station. This function is available on most routers in the market and is often known as “Port Forwarding“, “NAT Server” or “Virtual Server“. Take BitTorrent download function as an example, you have to forward the port range of BitTorrent service to the LAN IP of Turbo Station, e.g. forward port range 6881~6999 to 192.168.1.34. When your NAT router receives external port 6881~6999 packets at WAN side, the router will forward these packets to the LAN IP of Turbo Station. Moreover, to connect to the Turbo Station at home from WAN, you can simply open port 8080 (the TS-109 and TS-209’s default management port; or port 6000 of TS-101, TS-201, or TS-100) and forward the port to the LAN IP of Turbo Station. 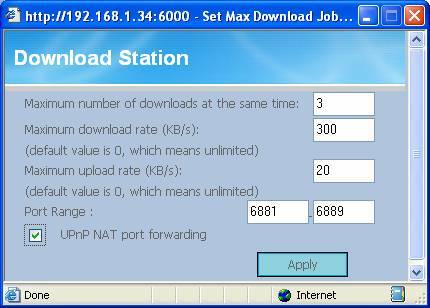 Turbo Station’s Download Station function supports UPnP NAT Port Forwarding of BT download. If your NAT router supports UPnP, you can enable UPnP on NAT. Turbo Station can then automatically notify NAT router to open the corresponding ports when performing BT download. 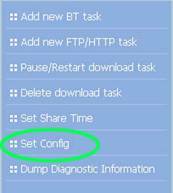 There is no need to enter the port range for BT download on NAT router by enabling this option. 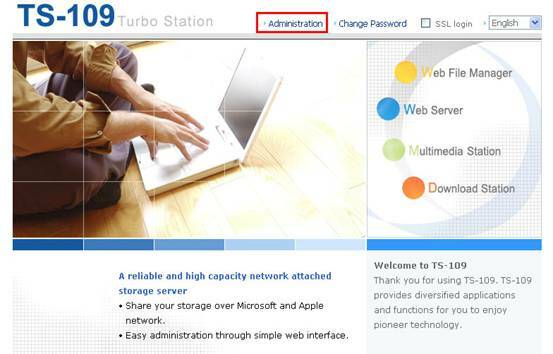 After completing these two settings, you can connect to the Turbo Station at home from the Internet via http://myTurboStation.dyndns.org:8080/ and manage the server. Go to Download Station in Network settings. Check the box “Enable Download Station” and click Apply. Download Station is then activated. After enabling Download Station, you can click on the link http://Turbo Station IP:8080/Qdownload/ to enter Download Station page. The maximum number of downloads at the same time is 10. We recommend that you set 3 or less as the concurrent sessions for this setting for faster download performance. Set maximum download and upload rates. The port range is the port numbers used by BT download. If your NAT router supports UPnP, it is recommended that you enable “UPnP NAT port forwarding” or open the port range on NAT router manually. For example, forward ports 6881~6999 to the LAN IP of Turbo Station: 192.168.1.34. You can search for the torrents you need on the Internet, e.g. http://www.bittorrent.com/. In this example, we selected a Casper cartoon. Click Download to download the torrent file. Go to Download Station page and add a BT task. Select the torrent file you have just downloaded. After you add a torrent, the task and the download status will be shown in the View Run List. When the download task completes, the task will be moved to Finish List and the downloaded file(s) will be saved in Qdownload folder on Turbo Station. The system will generate a folder named after the torrent file in this network share. You can access the downloaded file(s) via My Network Places or FTP. You can click on the file to view the video. Some files may be very large in size, esp. video files, and the download time will be relatively longer. You can let Turbo Station finish the download independent of computer. You can access Turbo Station to manage the download tasks from the web anytime, anywhere. 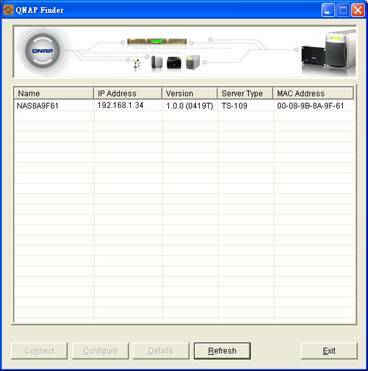 Besides web administration interface, QNAP also provides a Windows software QGet. QGet enables users to manage the download tasks of multiple Turbo Station (or TS-201) simultaneously on the same PC from LAN or WAN. You can manage your download tasks in school or at work. QGet supports intuitive drag and drop of torrent files, HTTP or FTP URL to the software interface for convenient adding of download tasks. Free and legal contents for BT download are now widely available on the Internet. BT download is one of the powerful functions of QNAP Turbo Station. The web-based configuration is simple and easy-to-use, and can be managed by anyone. Moreover, Turbo Station’s energy-saving, fanless, and aluminum alloy case design enable absolutely silent and stable performance for long-term download. With Turbo Station multimedia sharing function, the downloaded files can be applied in DLNA home network. Mp3 can be played by stereo acoustic system, and video files can be played on TV. Turbo Station plays a key role to connect these applications. It makes your digital home life more wonderful.